User Interfaces There are 10 products. Panel Mount Remote User Interface Provides Remote Field Bus Access For Up To 16 EZ Zone Controllers Via A Three Wire Connection. The EZKB-HAAA-AAAA Can Be Used For Remote Programing Or As A Simple Remote Temperature Indicator. Panel Mount Remote User Interface Provides Remote Field Bus Access For Up To 16 EZ Zone Controllers Via A Three Wire Connection. The EZKB-LAAA-AAAA Can Be Used For Remote Programing Or As A Simple Remote Temperature Indicator. Panel Mount Remote User Interface Provides Remote Field Bus Access For Up To 16 EZ Zone Controllers Via A Three Wire Connection. A Network Card Supporting EIA 232/485 Modbus RTU Protocol Provides Additional Network Access With Other Devices Such As PLC's Or PC's. The EZKB-H2AA-AAAA Can Be Used For Remote Programing Or As A Simple Remote Temperature Indicator. Panel Mount Remote User Interface Provides Remote Field Bus Access For Up To 16 EZ Zone Controllers Via A Three Wire Connection. A Network Card Supporting EtherNet/IP Modbus TCP Protocol Provides Additional Network Access With Other Devices Such As PLC's Or PC's. The EZKB-H3AA-AAAA Can Be Used For Remote Programing Or As A Simple Remote Temperature Indicator. Panel Mount Remote User Interface Provides Remote Field Bus Access For Up To 16 EZ Zone Controllers Via A Three Wire Connection. A Network Card Supporting DeviceNet Protocol Provides Additional Network Access With Other Devices Such As PLC's Or PC's. The EZKB-H5AA-AAAA Can Be Used For Remote Programing Or As A Simple Remote Temperature Indicator. Panel Mount Remote User Interface Provides Remote Field Bus Access For Up To 16 EZ Zone Controllers Via A Three Wire Connection. A Network Card Supporting Profibus Protocol Provides Additional Network Access With Other Devices Such As PLC's Or PC's. The EZKB-H6AA-AAAA Can Be Used For Remote Programing Or As A Simple Remote Temperature Indicator. Panel Mount Remote User Interface Provides Remote Field Bus Access For Up To 16 EZ Zone Controllers Via A Three Wire Connection. A Network Card Supporting EIA 232/485 Modbus RTU Protocol Provides Additional Network Access With Other Devices Such As PLC's Or PC's. 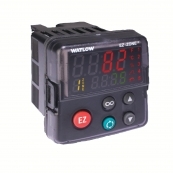 The EZKB-L2AA-AAAA Can Be Used For Remote Programing Or As A Simple Remote Temperature Indicator. Panel Mount Remote User Interface Provides Remote Field Bus Access For Up To 16 EZ Zone Controllers Via A Three Wire Connection. A Network Card Supporting EtherNet/IP Modbus TCP Protocol Provides Additional Network Access With Other Devices Such As PLC's Or PC's. The EZKB-L3AA-AAAA Can Be Used For Remote Programing Or As A Simple Remote Temperature Indicator. Panel Mount Remote User Interface Provides Remote Field Bus Access For Up To 16 EZ Zone Controllers Via A Three Wire Connection. A Network Card Supporting DeviceNet Protocol Provides Additional Network Access With Other Devices Such As PLC's Or PC's. The EZKB-L5AA-AAAA Can Be Used For Remote Programing Or As A Simple Remote Temperature Indicator. Panel Mount Remote User Interface Provides Remote Field Bus Access For Up To 16 EZ Zone Controllers Via A Three Wire Connection. A Network Card Supporting Profibus Protocol Provides Additional Network Access With Other Devices Such As PLC's Or PC's. The EZKB-L6AA-AAAA Can Be Used For Remote Programing Or As A Simple Remote Temperature Indicator.